Import-based discovery rules allow you to discover computers using a list of computer IP addresses or DNS names imported from a CSV file. Deploy a master agent on a machine in the company infrastructure. For details, see Step 1. Install and Configure Master Agent. Make sure you have an account with local Administrator permissions on all computers that you want to discover. This prerequisite is not required if you have specified a discovery account in the master agent configuration settings. For details, see Step 1. Install and Configure Master Agent. Make sure that remote computers are powered on and configured to allow discovery: the Remote Scheduled Tasks Management (RPC and RPC-EPMAP) firewall rules must allow inbound traffic. On remote computers that run a Windows desktop OS, the Windows Management Instrumentation (WMI-In) firewall rule must be configured allow inbound traffic. Prepare a properly formed CSV file with the list of computer IP addresses or DNS names to scan. For details, see Preparing CSV File for Import. If you plan to install Veeam backup agents as part of the discovery procedure, make sure that remote computers are configured to allow installation: the File and Printer Sharing (SMB-In) firewall rule must allow inbound traffic. 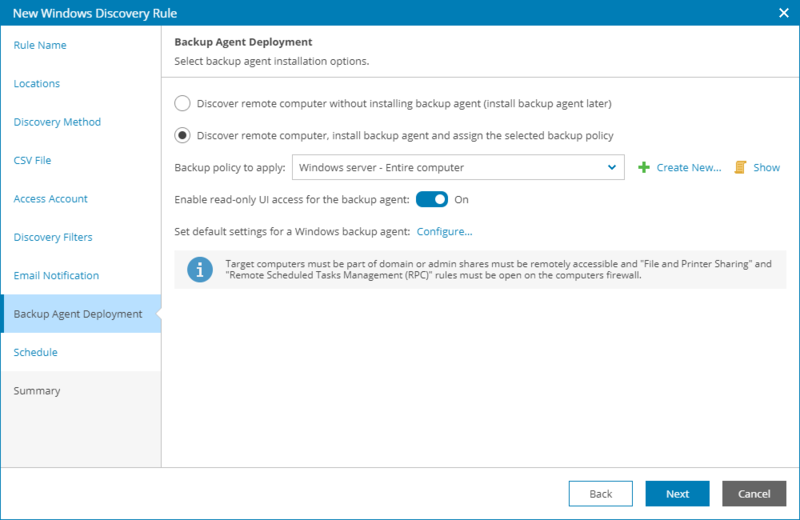 If you plan to assign a backup policy as part of the discovery procedure, create a new backup policy or check and if necessary customize one of the predefined policies. For details, see Configuring Backup Policies. To perform import-based discovery, you must create a CSV file with a list of computer IP addresses or DNS names to scan during discovery. In the menu on the left, click Rules. On the Rules tab, click New. Veeam Availability Console will launch the New Rule wizard. At the Rule Name step of the wizard, specify a discovery rule name. At the Companies step of the wizard, choose one or more companies for which the discovery rule is configured. Use the search field at the top of the list to find the necessary companies. Click a link in the Locations column, then click a link in the Master Agent column, and select a management agent that will be used as the master agent for discovery in each company location. By default, discovery is performed in all company locations where you deployed a master agent. 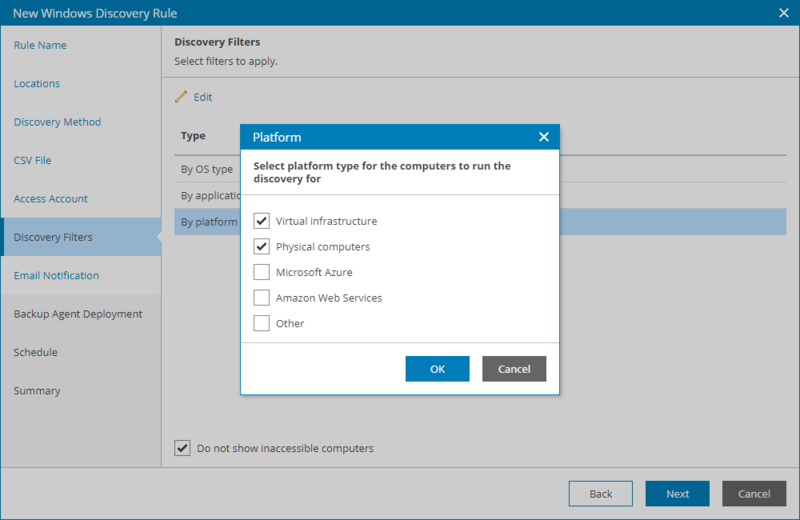 If you choose to perform discovery in multiple locations, after you complete the wizard steps, Veeam Availability Console will create a separate discovery rule for each location. If you do not want to perform discovery in some company locations, clear check boxes next to these locations. For details on working with company locations, see Managing Locations. At the Discovery Method step of the wizard, select Computers from CSV file. At the CSV File step of the wizard, click Browse and specify a path to a CSV file that contains a list of IP addresses or DNS names of computers that must be scanned. At the Access Account step of the wizard, specify credentials of an account that the master agent will use to connect to computers within the discovery scope. The account must have local Administrator permissions on all discovered computers. 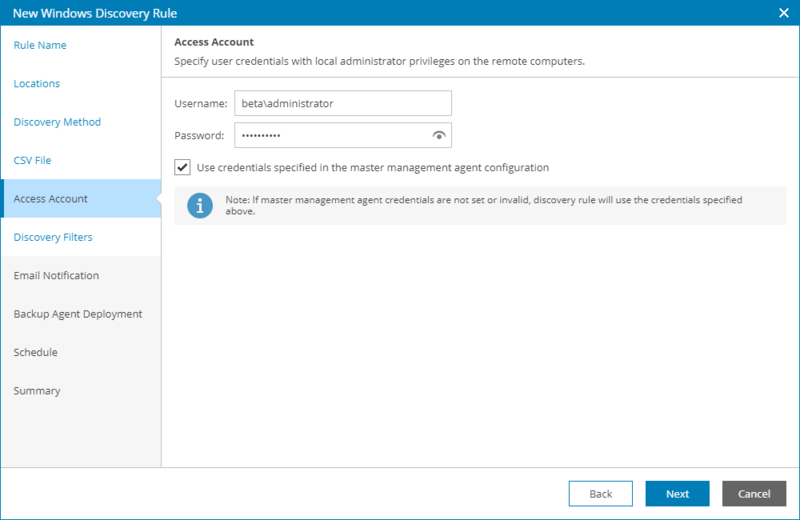 If you have specified a discovery account in the master agent configuration settings, select the Use credentials specified in the master agent configuration check box. For details on specifying master agent configuration settings, see Step 1. Install and Configure Master Agent. Credentials specified in the master agent configuration take precedence over credentials specified in the discovery rule. For discovery, the master agent will use an account specified in its configuration settings. In case this account is not valid or not set, the master agent will use an account specified in the discovery rule. At the Discovery Filters step of the wizard, choose what filters you want to enable for discovery. To filter computers by OS type, select By OS type in the list and click Edit. In the Operating System window, select the type of OS that must run on discovered computers (Server operating system, Client operating system). Click OK.
To filter computers by application, select By application in the list and click Edit. In the Application window, select applications that must run on discovered computers (Microsoft Exchange Server, Microsoft SQL Server, Microsoft Active Directory, Microsoft SharePoint, Oracle, Other Applications). Click OK.
To filter computers by platform, select By platform in the list and click Edit. In the Platform window, select platforms on which discovered computers must run (Microsoft Hyper-V and VMware vSphere, Physical computers, Microsoft Azure, Amazon Web Services, Other). Click OK. If you want to perform discovery among accessible computers only, select the Do not show inaccessible computers check box. Different types of filter conditions are joined using Boolean AND operator. For example, if you enable filters Server operating system, Microsoft SQL Server and VMware vSphere, the list of discovered computers will include only VMware vSphere VMs that run Windows Server OS and Microsoft SQL Server. At the Email Notification step of the wizard, you can enable notifications about discovery results by email. Select the Send notifications check box and specify a schedule according to which email notifications must be sent. In the Subject field, specify the subject of the notification. In the To field, specify an email address at which the email notification must be sent. Select the Send notification email after the first run check box if a notification about discovery results must be sent after the first run of the discovery rule, regardless of the specified schedule. If you do not want to install Veeam backup agents as part of the discovery process, leave the Discover remote computer without installing backup agent option selected. If after discovery Veeam backup agents must be installed automatically, select the Discover remote computer, install backup agent and assign the selected backup policy option. From the Backup policy to apply list, choose a backup policy that must be assigned immediately after installation. To view the selected policy details, click the Show link. If you do not want to assign any backup policy after installation, choose No policy from the list. If you do not have the necessary backup policy configured yet, you can click the Create New link to create a new policy, without exiting the New Rule wizard. For details on backup policies, see Configuring Backup Policies. By default, the read-only access mode is enabled for all Veeam backup agents installed as part of discovery. To disable the read-only access mode for Veeam backup agents on discovered computers, set the Enable read only UI access for the backup agent toggle to Off. For details on the read-only access mode for Veeam backup agents, see Enabling Read-Only Access Mode. At the Summary step of the wizard, review discovery rule settings. To start discovery after you save the rule, select the Launch the discovery rule when I click Finish check box. If you do not select this check box, you will need to launch discovery later. For details, see Running Discovery.